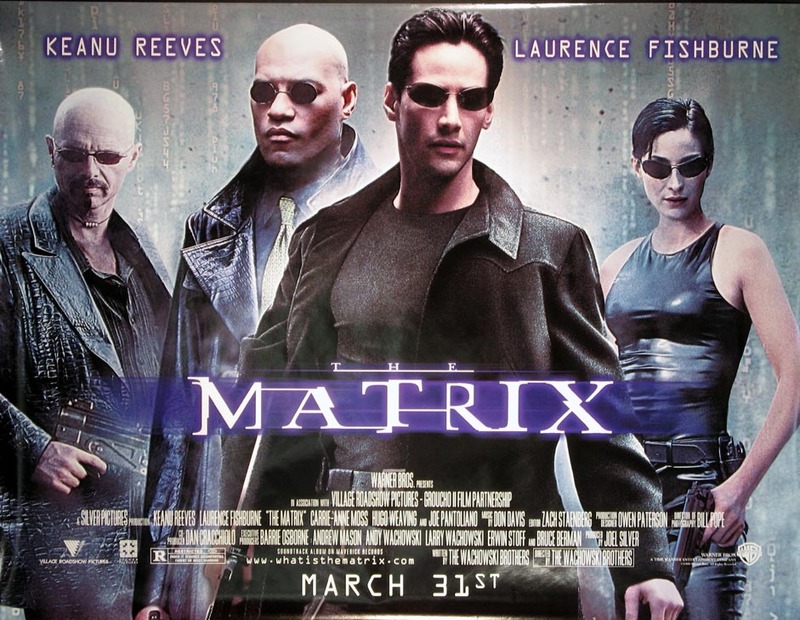 I have distinct memories of being the only person in sixth grade who had not seen The Matrix–well actually there was one other girl if we’re being honest–point being this film enraptured everyone entering into the 2000s. I was a sixth grader in 2002 and not having seen the 1999 film was a minor crime and I surely felt it. I don’t remember when I first saw it, but I certainly did enjoy it as well as its sequel (I never saw the third film for whatever reason, I guess it didn’t come on TV at the right time.) Going into this rewatch I wondered if it would be outdated or cheesy; if the mind blowing special effects (which are still talked about whenever somebody does some sort of dodge) wouldn’t live up to our modern CGI or whatever. I’ll come right out and say it, this film certainly holds up. The action sequences still deliver in ways that are exciting. Though I imagine it (along with Tarantino’s 2003 release Kill Bill) owes a lot to old martial arts films that I am just entirely unfamiliar with, the action here is still some of the most exciting stuff I’ve ever seen. From Trinity’s opening wall running scene to Neo’s bullet dodging lean (which I must point out that though this is the most famous action moment in the entire film, the way this move ends is with him ultimately getting shot. Nobody remembers that this was ineffective, while all the other parts of that scene are fantastic and actually work). When Neo comes into his calling as “the one” and starts just wiping away bullet after bullet and defeats Agent Smith in slow motion, no lie I had chills. I think this is a testament that the rest of the movie also works, all effects aside. I’ve long been a proponent that action films must have a solid story or ten years into the future they can end up as outdated boring spectacle (looking at you Avatar). 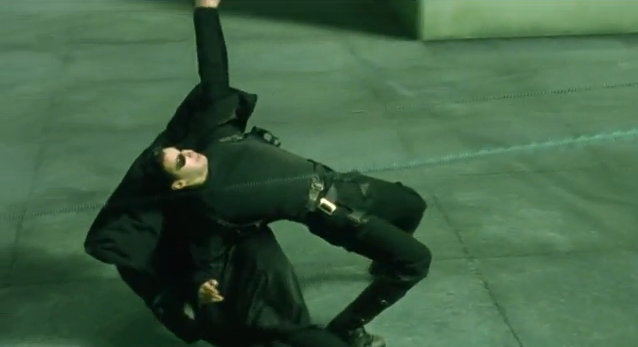 The Matrix dodges this problem in two ways, by using inventive imagery and by shoving its standard storytelling devices under layers and layers of post-apocalyptic plot. I’m a sucker for movie worlds that feel fresh, I fell head over heels for Wreck it Ralph upon first viewing because its real life video game world was the stuff of my greatest childhood imaginings. The Matrix invented an exciting new world–one that wasn’t all that different from previous stories (the computers win story of The Terminator franchis + the chosen one in pretty much any movie), we’ll go into this more later, but the world is built upon both very established rules as well as a repeated aesthetic and this is what ultimately allows it to thrive. When Neo first chooses the red pill Morpheus guides both him and us through a set of rules for the new world. Our eyes are unveiled, we find out that “the matrix” is a computer system that every human believes themselves to be a part of (also a thought experiment that now gets The Matrix into most Film and Philosophy programs), there is a loading zone where computer programmers can write code to teach them or give them things to take into the new world, they can download Kung Fu into their brains, etc… Even as I was watching it, knowing what was to come and mostly remembering each of the rules, Morpheus’ revelations are exciting. The rules establishment is met by an aesthetic and a repetition of symbols that fully establish the whole thing. Repeated symbols draw us in and connect us quickly with subject matter. This is why religious liturgies and reality show production design (big leap there, I know) draw us in even when their content isn’t great. The Matrix has its phone booths which are entirely unnecessary to the plot (the way that they get transported back to consciousness in their ship is via telephone booth?!? They have some extremely special way of getting transported into the world, but the way they get out is entirely reliant on a working telephone booth! They could have used anything to get them back!) yet it entirely works because of the aesthetic it adds. Watching characters rush to the phone booth and disappear just before an agent attempts to crush the booth adds something tangible to the film. Let’s not forget how the actual matrix itself looks either, its green lines of code running down sideways that certain people can read and see exactly what is happening. This is a brilliant image, forever ingrained into my memory as ‘the matrix’, akin to Star Wars‘ light sabers or Storm Trooper costumes (or the Darth Vader Mask or the X-Wing or anything from those films basically! ), Terminator 2‘s shape-shifting T-1000, or Jurassic Park‘s ripples in the glass of water. Having creative imagery that viewers can remember, like a liturgy gets repeated, can turn a film into a classic. The Matrix takes place two hundred years into the future, but its costuming very much feels like 1999. The Wachowskis do their best to create some futuristic world, but as is often the case with trying to create futuristic visions, their ideas get caught up with modern notions of cool. Here, this is very much caught up in a rising internet culture with Neo a part of an internet subculture that existed at the time. It’s strange to think that the internet was barely even a thing upon the film’s release or even better that the Wachowski’s chose a weakly internet hacker to become a sort of super hero. Its cyberpunk, techno loving self does feel very much like a 1999 sort of idea of the future. This was a year in which Britney Spears was huge, Eiffel 65’s “Blue” dominated the charts, and Limp Bizkit was a thing. I think for the most part you can ignore the film’s 1999-ness, unlike what I remember from the sequel which I believe features giant techno dance parties (this is how the world will end, not with a bang, but with a rave!). It’s not 2199 yet, but I somehow doubt future stylings will consist only of skintight leather and long black trench coats, but hey, I am coming from my very 2015 perspective. The storyline is mostly follows archetypes of those before it, in fact I distinctly remember my sophomore English teacher using The Matrix as an example to teach us what an archetype was (is The Matrix an archetype of archetypes!?! ), telling us (and spoiling the ending for me) that it followed the Christ figure archetype. I think this is true and the rest of the movie’s oracles, AI computer enemies, betrayals from trusted figures, and finding redemption upon true belief aren’t really anything new, but then again most stories aren’t. The Wachowski’s put the whole thing under the veil of something exciting and it’s not like it straight up steals whole plot lines like Avatar did with Pocahontas. On a different note, I was impressed by how much diversity the Wachowski’s place in the film. The Nebuchadnezzar crew features eight members, three of them black and two of them women. The oracle is also a black woman, making four of the film’s featured characters black; I challenge you to try to come up with another film that has that off the top of your head–it’s a rarity. Even so, the film has not escaped criticism. Last year, Tasha Robinson of The Dissolve, came up with something that she called “Trinity Syndrome”. Essentially the idea was that female characters are being created that at first seem strong, but are still relegated to serving the main character’s (often a male) purposes. It’s interesting that she uses Trinity as the main example, but it makes a lot of sense. Trinity comes off strong right out the gate–she’s a mysterious character who exhibits flashes of action brilliance–running along walls and beating up unknowing policemen left and right. As the film progresses she loses her importance while retaining an aura of mystery, but then the Wachowski’s take her character and turn her into someone whose job is only to advance Neo (literally, the Oracle has prophesied that her life’s purpose is to fall in love with “the one”). The scene where she kisses Neo back to life is no doubt the worst part of the movie on so many levels, taking everything she has built into and turning her into a pretty lame love interest device. It’s so unnecessary, plus Keanu’s Neo is so (soooooooo) much less interesting than Carrie Ann-Moss’s Trinity. She really deserves better. Overall, rewatching it and doing these rewatches is really to determine whether the films that were cultural touchstones in their time are any good. The Matrix is deserving to be in the cultural canon, referenced here and there, occasionally parodied, and remembered fondly. But now the question, is it any good? A great movie. The sequels heavily dented its legacy, but watched as a standalone film, it’s hard to deny its brilliance.